Everybody knows that all the students are excellent at 2 things – procrastination and multitasking. Though, nobody knows that this excellence requires years of hard work and practice. Look through some common stages of procrastination almost all the people in college or university are aware of. You check the due date and realize that the paper isn’t due in the next two weeks. You feel calm and secure as you have a lot of time to do it efficiently. Every day you keep on assuring yourself that there is no need to panic, the assignment is not difficult so you may postpone the start of writing for a couple of days more. Most likely, this stage continues until there is approximately only a week left and you come to realize that you should actually start doing something – that is when the next phase begins. Okay, so the due date came closer and now you start thinking more of the project you have, and you indeed start to think about beginning writing it but you never do begin. Why? Because you are not in the mood today, and it's already evening, and it's better to start doing it in the morning and with a right attitude. You decide to postpone it for tomorrow. Yes, tomorrow will be a perfect time. This stage usually lasts one or two days until you have only a couple of days left until the due date. That is when the creative stage begins. One thing you have finally made yourself to do - to open up your drawer and pull out the textbooks. Then you realize that your desk is a mess (and you can't complete a fantastic paper in a mess, right?) so you decide on cleaning it quickly, every inch of it...twice. After your table is sparkling you suddenly see that your whole room needs cleaning as well, and if you have already started improving everything why not to send this pile of dirty laundry to the wash? Now, after all the hard work you have done, you surely deserve a good diner and some time to rest. Oh wait, you were to write the assignment...but how can you start doing it if you are so tired? Better postpone it for tomorrow. No doubt, this is the hardest stage to survive. When you catch a small glimpse of yourself in the mirror while making another cup of coffee, you realize that this is your deserved punishment for waiting until the last days. You can't remember the last time you slept or took shower, you can't name the last food you had eaten except coffee. Then you wipe your tears, take your cup and get back to work as you still have to write half of the paper within the next three hours. 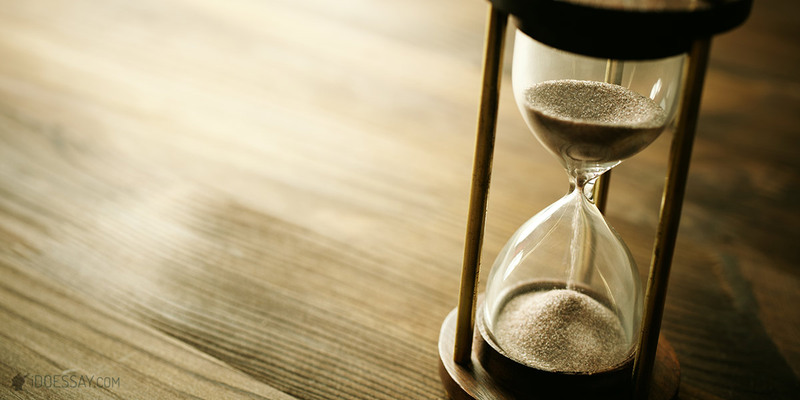 Let's be honest, even if you think that this is the last time you waited until the end of the deadline, most likely, you will repeat it again and again. But don't worry, a recognition that you have a problem is the first step to resolving it, they say. Let's wait and see, right?